The highly anticipated undisputed women’s middleweight championship fight between American hotshot Claressa ‘T-Rex’ Shields 6-0 (2) and German veteran Christina Hammer 23-0 (10) has been put on ice with news that Hammer is suffering from a medical issue that will prevent her from training for the next few months. 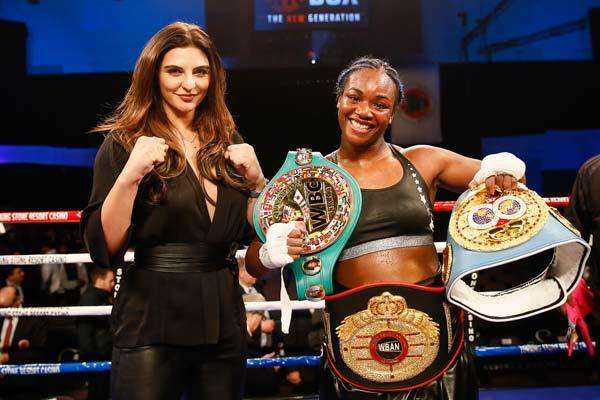 Shields was set to stake her IBF and WBA middleweight belts against Hammer’s WBC and WBO straps in Atlantic City, New Jersey on November 17. The 23-year-old Shields from Flint, Michigan dropped the bombshell on social media. “Very, very, very disappointed. I’ll let my team do the announcement! But what I will say is… I want this fight 100%. I am not the one sick. Idk the ins and outs of Hammers condition, but she can’t box til March the doctor says. I’m still going to fight the 17th Nov,” Shields shared with her followers. The 28-year-old Hammer confirmed the news on her social media accounts. “Dear Hammer Fans, I have problems with my health I try my best as a CHAMP to train hard for this special Fight but I feel bad, my doctor doesn’t allow me to fight and no hard training for a few more months, it’s really sad now but this fight will come!! !” posted Hammer.